Sweet Sticky Rice with Durian-Coconut Cream (Khao Niao Thu-rian ข้าวเหนียวทุเรียน) is how I cope. What else can you do when May rolls around and your friends and family in Thailand seem intent on taunting you – just like they do every year – with pictures of plump durians while gushing over how fresh, how delicious, how abundant, how inexpensive they are this time of year? You drive to a local Asian grocery store, of course, and get yourself a box of frozen deseeded durian [*] – the only doggone choice available. You make this. Then you gorge yourself silly to numb the pain. 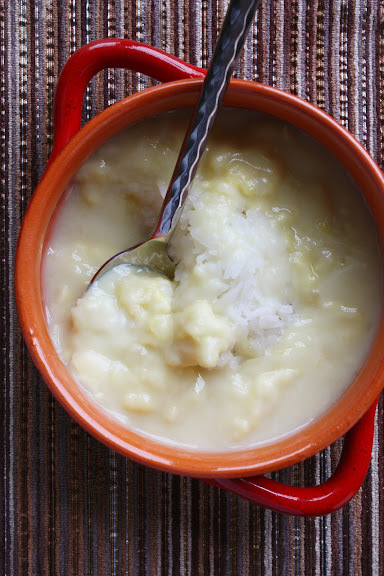 All you have to do is make a batch of sweet sticky rice (as explained in my post on Thai coconut sticky rice with mango) and let 450 grams of your frozen durian pulp thaw out. Empty a 13-ounce can of coconut milk into a medium pot. Add 100 grams of granulated sugar (or better 110 grams of chopped palm sugar) to it along with 1 teaspoon of salt (the salt is very important! ); bring the mixture to a gentle boil. Gently stir in the thawed durian pulp to the coconut milk mixture (some of the pulp will meld into the sauce; some will remain chunky. That’s the way it should be. Besides, when you don’t work with fresh durian, that’s pretty much the only way it can be). This is the time when you’re supposed to taste for sweetness. The amount of sugar specified above is just an estimate. You can’t know how sweet the durian coconut cream will be until the durian pulp has been added. If more sugar is needed, add it now. Keep in mind, however, that this cream will go on top of the sweet sticky rice which also contains sugar, so adjust accordingly. Heat through and remove the pot from heat. This makes about 6-8 servings. To serve: scoop about ¾ cup of the sweet sticky rice into a small dessert bowl and spoon around ¾ cup of the durian coconut cream over it. In my opinion, this dessert is best served warm or slightly warmer than room temperature. [*] I’ve got people living along the east and west coasts of the US telling me all the time that they are able to get fresh durians. I doubt those are fresh. From my experience, they’re all frozen durians that have been left to thaw at room temperature. They look like they’ve just fallen off the tree, but they’re previously frozen and that means the texture of the pulp has been greatly compromised, if not substantially ruined. The texture of frozen durian, like the one I use here, is nothing like that of fresh durian. Once thawed, it’s more like chunky durian purée than anything. I don’t find the pulp of frozen whole durian (still inside the husk) to be that much different than frozen durian pulp, so I usually go for the latter and save myself from durian thorn-related injuries. Frozen durian is still better than no durian, though. So I’m not complaining. But if my very first time eating durian had been with previously-frozen-then-thawed durian, there might not have been a second time. You’re so right! I’m always a little shocked when I read durian “reviews” from the states. If you’re eating frozen durian (and if you’re in the states, it’s either frozen or shipped when way too green) then you are in NO position to pass judgement on durian! Durian with sticky rice is one of my favorites desserts here, but I sometimes find it too sweet for me. I’ve started buying sweet sticky rice and pairing it with fresh (and super soft) durian instead (similar in method to sticky rice with mango). I don’t know if there’s a precedent for this, though. The usage of coconut oil into thai food makes it more special. I just saw tons of fresh Jack fruit today for the first time, but didn’t know what it was. My son and I were exploring a store there at the International District in Seattle, WA. Great recipe. I’ve used it to “de-virginize” durian virgins. Frozen durian tastes awesome enough to me; someday I will visit SE Asia and be sure to do so during durian season so I can enjoy the real thing.